They say the plan should be dropped because it was championed by Mayor Catherine Pugh, who is under investigation amid possible influence-peddling allegations and who received $16,000 in campaign contributions from top university officials a month before the police force legislation was introduced in Annapolis. 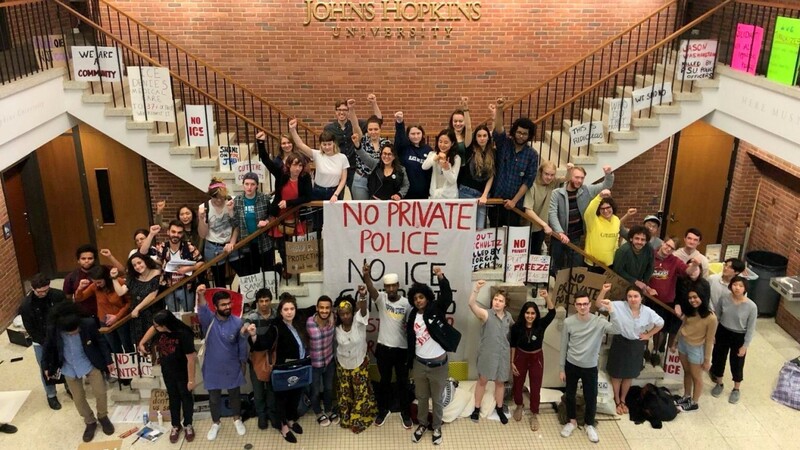 “We urge the City Council to take appropriate actions to stop this private police plan – forged through corrupt dealings between JHU officials and the disgraced mayor – before it becomes irreversible,” Students Against Private Police (SAPP) tweeted. 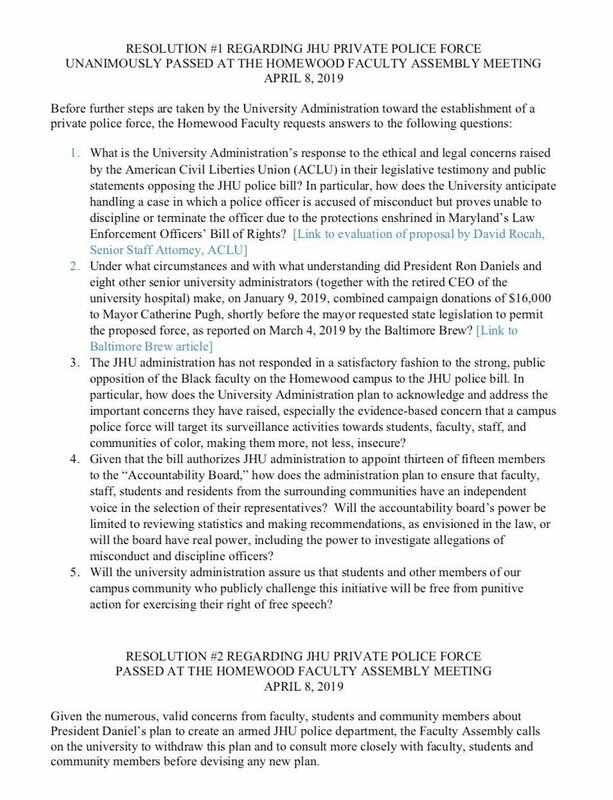 The checks that administrators wrote to the Committee to Elect Catherine E. Pugh all on a single day – contributions they technically made as individuals – have also drawn criticism from faculty members. 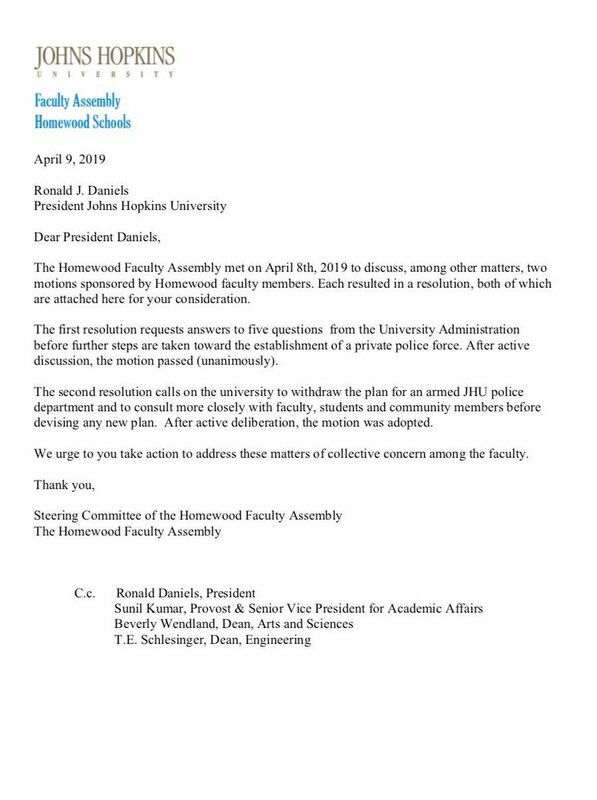 Yesterday, the Homewood Faculty Assembly voted unanimously to demand that the administration answer questions about the political donations and other issues. The faculty group also demanded assurance that students currently occupying and protesting will face no punitive action and demanded amnesty for students and faculty involved in the protests. Asked about the administrators’ donations, a Hopkins spokesperson said Pugh’s support predated the contributions to her reelection campaign. “The mayor was on the record in support of a JHPD back when the legislation was first introduced over a year ago,” Karen Lancaster, assistant vice president for external relations. A demonstration drew hundreds of students and supporters to Wyman Park, followed by the the occupation of Garland Hall begun on April 3. Since then, sustained by donated food and drink, about 15 students a night have been sleeping in the building. The Homewood Faculty Assembly voted unanimously to demand that the administration answer questions about the political donations and other issues. They are also protesting the school’s contracts with ICE (U.S. Immigration and Customs Enforcement Agency) and supporting the “Justice for Tyrone West” movement. West died in 2013 after an altercation with officers from Baltimore and Morgan State University during a traffic stop. Hopkins has been pushing since last year to get police powers for its security force. School officials have argued that a police department is needed at three of the university’s Baltimore campuses – Homewood, Peabody and East Baltimore – to combat what Daniels has called a sustained spike in muggings and other crimes that threaten students, staff and employees. Students have pushed back, characterizing the arming of school police as the militarization of the campus and voicing concerns about a school administration they said lacks transparency and accountability. “They are a lot like city government – top-down and non-democratic,” Wattal said. Lancaster said the legislation passed in Annapolis, the Community Safety and Strengthening Act, will protect the campus community and has a number of built-in safeguards. It “puts in place measures to ensure public accountability, public transparency and public input, and we will work together to build a model of constitutional community policing,” she said in an emailed statement. “After the governor signs the bill into law, it will go into effect on July 1, and we will move into a multiyear period of implementation, which will include engaging with the community regarding the MOU with BPD and recommendations for the first Johns Hopkins Police Accountability Board,” Lancaster said. “We have been unequivocal in our public statements concerning the consequences of recent immigration policies that have a clear, direct and demonstrable impact on members of our university community,” she said. “We remain steadfast in our commitment to supporting our international and DACA students, offering broad access and support to our students, faculty, and staff without regard to immigration status and providing exceptional care to immigrant and refugee populations in our hospitals and clinics in the United States and around the world. Considering that the enabling legislation has already passed, what, then do the students hope to gain and how long do they plan to stay? “As long as we need to – indefinitely,” Wattal said. She pointed out that, while the legislation permits the school to establish an armed police force, it does not require them to. Neighboring communities who need to sign the memorandums of understanding with Hopkins could refuse to. A group of city residents who live near Johns Hopkins campuses have filed the paperwork to launch a petition drive to put the creation of an armed Hopkins police force on the 2020 ballot.